Happy Belated Meat-Free Monday, Everyone! I apologize for my ridiculously tardy recipe post…I had a culinary catastrophe. The recipe I had intended to post was a train wreck, ending up looking like mushy dog food. (Yikes!) See this is why I always test out recipes for you all first…so you don’t have to go through the same disasters! This recipe is a robust yet simple pasta dish…perfect for summer. It comes from my dear friend Lauren, who gave it to me as a gift for my birthday last year. Feel free to garnish with Parmesan or vegan Parmesan cheese. 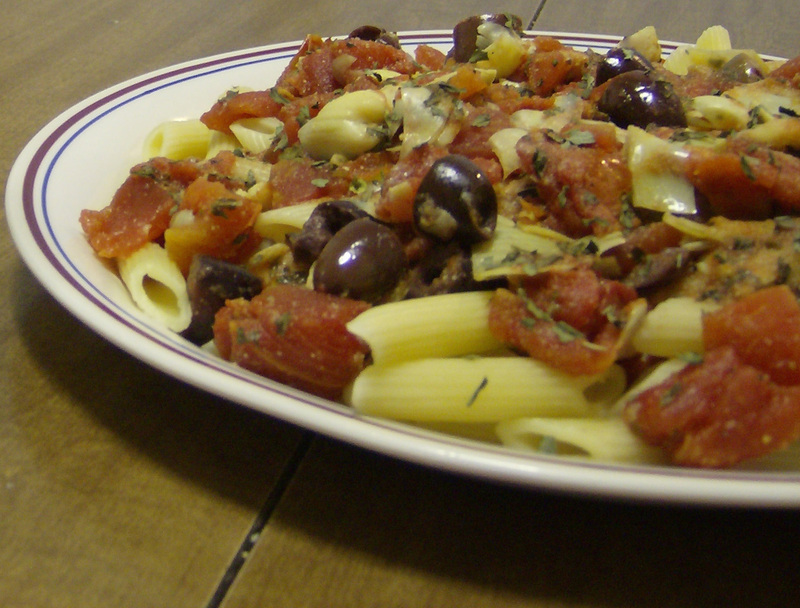 For all you starch fiends like me, this pasta will sate your carb cravings. Cook pasta until tender. In the meantime, saute garlic and onions in olive oil until onions are clear. Add basil, wine and entire can of tomatoes with liquid. Add artichoke hearts and olives. Simmer for 10 minutes. Drain pasta. Toss pasta with sauce. Is there anything Lauren can’t do?